Published: Sept. 16, 2016 at 01:09 p.m. Updated: Sept. 16, 2016 at 01:59 p.m.
Football is the ultimate team sport, but sometimes one player takes over a game. No matter what the defense or special-teams units do, he gets the ball in his hands and makes things happen. We saw that type of performance in Week 1 of the NFL season, when the Bengals’ A.J. Green went off against Darrelle Revis and the Jets. Which college football players are capable of single-handedly changing the scoreboard in their team's favor? Here are 10 with that ability. If you didn't get a chance to watch the Hilltoppers take on Alabama last week, you missed Taylor's national coming-out party. Scouts already knew about his big-play ability, though, as he tied for the FBS lead in receptions of 50 yards or more last season. He's the real deal. Allen, a hurdler, was good enough for the Olympics, and he’s good enough for my gamebreaker list. As a sophomore, he averaged nearly 17 yards per catch. In 2015, however, he didn't replicate that success while trying to return from a knee injury. Allen already has two catches for more than 50 yards this year, including a 77-yard score against Virginia last weekend. Those strides will make it very difficult for smaller cornerbacks to stay with him downfield ... and he'll simply leap over any low tackle attempts. At 5-foot-9, 180 pounds, Pumphrey does not have prototype size for a running back. But if you think you're going to stop him one-on-one as a runner or receiver with any space around him, forget it. 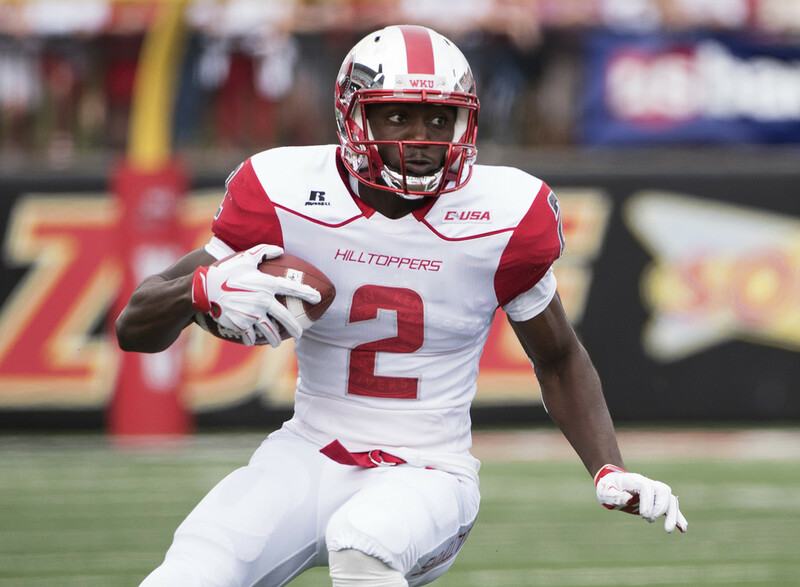 This jitterbug was one of six backs in America with at least six rushes of 40-plus yards in 2015, and he averaged a wideout-like 15 yards per reception. His uncanny ability to set up defenders for a big cut makes him extremely dangerous. After lighting up special-teams coverage units for the Bulldogs for two years (five return touchdowns in 2014-2015), McKenzie has brought his big-play ability to the offense for his junior year. He has nearly as many receptions (eight) in two games as he did last season (10) and has covered more yards (183 vs. 123), with two touchdowns. He's lightning in a bottle when he has any real estate to work with, utilizing his small frame to dance into lanes as a returner and displaying the long speed to burn up chunks of yardage. He's a lot of fun for fans to watch, and a nightmare for opposing coaches. Yes, Jackson is primarily a defender. But the Trojans tried to get the ball in his hands regularly over his first two seasons because his elite speed and quickness make him a threat to take the ball to the house on every touch. He already has 11 career touchdowns, including five among his 27 career receptions. Jackson's covered almost 1,500 yards on kickoff returns, scoring twice. He scored his third career punt-return touchdown against Utah State last week. Go ahead, stack the box against the Tide's rushing attack. Ridley is just waiting for you to do so. With freshman quarterback Jalen Hurts looking to throw the ball downfield, Ridley will be making a lot of big plays using his outstanding hands, speed and agility. His adjustment to Hurts' downfield throw over the wrong shoulder last week (which he high-pointed above a defender, by the way) was worthy of All-American notice; look for more vertical attacks from Lane Kiffin's offense this year. Fournette’s ability to break off long runs (he had four 60-yard gallops last season) as he plows through tacklers makes him a legitimate gamebreaker. In fact, if not for an injury suffered late in the Tigers' loss to Wisconsin two weeks ago on a 15-yard run, he probably would have carried the team into the end zone in the fourth quarter. Instead, QB Brandon Harris threw an interception that secured the Badgers' win. Cook had as many 20-yard, 40-yard, and 60-yard rushes as any back in the country in 2015 -- and he played most of the year with a touchy hamstring. Once in the open field, a safety had better get an angle on him or else Cook is finding the end zone. Last week, his 37-yard touchdown against Charleston Southern showed what can happen if he isn't wrapped up in traffic; his balancing act and then explosive running coming out of the box showed that he's ready to break out against better opponents -- like FSU’s foe this weekend, Louisville. Every time McCaffrey touches the ball as a runner, receiver or returner, fans hold their breath. His combination of quickness, football IQ, and toughness allowed him to break Barry Sanders' single-season all-purpose yardage record last season, and he got off to a strong start this season in Week 1 against Kansas State, despite having a long punt return called back. He's worth the price of admission. This sophomore has been a one-man wrecking crew this season. He ranks third in the FBS in rushing yards from the quarterback position with 308 yards (scoring twice) and eighth in passing yards (697). Whether he's zipping the ball downfield to James Quick or jumping over would-be tacklers, Jackson's an exciting gamechanger whose best football is yet to come. He'll have a chance to be in front in the Heisman Trophy race with a big game on Saturday against Florida State.